People and healthcare organisations are being urged to check if they have the affected Aquilon series of nebulisers. Following withdrawal of CE certification for the Aquilon series of nebulisers, the manufacturer has continued to place the nebulisers on the market. We have issued a Medical Device Alert today to all relevant healthcare professionals. The affected nebulisers and packaging do have a CE mark placed on them, however this has not been obtained through appropriate regulatory oversight and therefore, their safety cannot be assured. A medical device cannot be marketed in Europe without carrying a CE mark. It is applied by the manufacturer and means that the device meets the relevant regulatory requirements and, when used as intended, works properly and is acceptably safe. This issue affects Aquilon2, Aquilon, Aquilon+ and Aquilon Pro series medical nebulisers manufactured since 01 April 2015. MHRA believes that more than 8,000 Aquilon nebulisers, which have been on the market since 2015 are affected in the UK. If there is suspicion that a nebuliser is affected, people are advised to stop using immediately, dispose of the device and to use an alternative nebuliser where available. It is advisable that you speak to your healthcare professional or GP who can help you find out if your device is affected, give you advice on how to dispose of it and provide a replacement. We have been made aware that the manufacturer has continued to sell nebulisers even after their CE certification was withdrawn. We cannot guarantee they have been manufactured to an appropriate standard. These devices deliver potential life-saving treatment and it is vital they operate correctly when needed. We are taking action, as a matter of priority, to make sure people are aware the CE mark has been withdrawn and that these devices should not be used and should be disposed of. Patient safety is our highest priority and we urge anyone with questions to speak to a healthcare professional as soon as possible. Follow all the recommended steps for the preparation of Bleo-Kyowa in accordance with the Summary of Product Characteristics. Carefully inspect the reconstituted product under a bright light. If particulate or glass matter is visible after reconstitution, do not administer the product to patients. Please retain the vial, quarantined safely away from other stock and notify the marketing authorisation holder (details overleaf). If there is no visible particulate matter after reconstitution, the use of a standard 5-micron (5 µm) filter needle to withdraw the reconstituted product from the vial prior to administration is recommended as glass particles may be difficult to see. Recipients of this Drug Alert should bring it to the attention of all relevant contacts involved with the supply and administration of chemotherapy, including: hospital pharmacists; hospital clinicians; ward staff; chemotherapy unit staff; nursing staff and clinic staff by copy of this letter. In addition, the relevant Healthcare Professionals should be informed where the product is being used in a domiciliary setting. 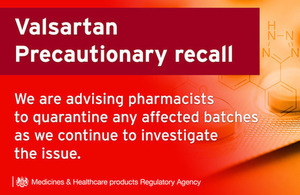 Local area teams are asked to forward this to relevant clinics and hospital pharmacy departments. Three specific lots of asthma inhalers are being recalled, including preventer and emergency relief inhalers. Only a small proportion of the units are defective (images below). Other asthma inhalers, including the more commonly used Ventolin Evohaler, are not affected. Information is also available to patients and healthcare professionals by contacting GSK’s Customer Support Team via customercontactuk@gsk.com or calling on 0800 221 441 (option 4). Backed by convincing survival data, AstraZeneca’s Imfinzi is breaking out on its own. Friday, the drug snagged an FDA green light in previously treated, stage 3 lung cancer patients whose tumors can’t be removed, a market without a single competitor in sight. That’s an entirely new experience for Imfinzi, the fifth-to-market PD-1/L1 immunotherapy, which faces four other contenders in its only other approved indication, bladder cancer. With those rivals years away from gaining a similar nod in lung cancer, Imfinzi could hit $1 billion in worldwide sales from that indication alone, Leerink Partners analyst Seamus Fernandez has predicted. Bernstein’s Tim Anderson has estimated that the opportunity in the world’s top seven markets tallies about 47,000 patients. The FDA approved the new use based on phase 3 data showing Imfinzi could stave off disease progression for a whopping 11.2 months longer than chemo achieved, good for a 48% reduction in the risk of disease progression and death. But even before AZ rolled out those numbers at September’s European Society for Medical Oncology (ESMO) annual meeting, its top-line data from that trial, dubbed Pacific, were generating plenty of buzz. The trial “is the kind of breakthrough that promises to pull upward on the I-O market size,” he wrote to clients in July. AstraZeneca certainly hopes so. The company is counting on Imfinzi to help it come out of what CEO Pascal Soriot earlier this month called a “really difficult period,” and he ensured investors that there was just one more year to go before “fast growth” sets in. The European Medicines Agency has delivered the European Union (EU) commendations for the influenza virus strains that vaccine companies should include in vaccines for the inhibition of seasonal influenza from autumn 2017. Every year, EMA’s ad hoc Influenza Working Group issues EU recommendations for the composition of seasonal influenza vaccines on the basis of interpretations by the World Health Organization (WHO). The recommendations for the influenza season 2017/2018 were endorsed by the Agency’s Committee for Medicinal Products for Human Use (CHMP) on 23 March 2017. These recommendations also relate to the manufacturing of live mitigated influenza vaccines. The term big data refers to tremendously large sets of information which involve specific computational tools to enable their examination and exploitation. These data might come from electronic health records from millions of patients, genomics, social media, clinical trials or impulsive adverse reaction reports, to name just a few. The massive volume of data has the potential to contribute suggestively to the way the assistances and risks of medicines are evaluated over their entire lifecycle. Together with the heads of the national competent authorities in the European Economic Area (EEA), known as Heads of Medicines Agencies (HMA), the European Medicines Agency (EMA) has established a new task force to explore how medicines regulators in the EEA can use big data to provision research, innovation and robust medicines development in order to benefit human and animal health. Teamwork with other regulatory authorities and partners outside the EEA to consider their understandings on big data enterprises. NHS Digital has circulated the Summary Care Record (SCR) usage calculator tool to support community pharmacy contractors in checking and aggregate their SCR usage. The Quality Payments scheme, which measures each appropriate pharmacy against quality standards and awards points for each one fulfilled will be a key factor in incapacitating the pharmacy cuts. Use of the Summary Care Record accounts for 10% of Quality Payments points over the year, meaning it could be worth up to £1,280 per pharmacy. According to NHS England’s quality criteria regulation, pharmacists will need to meet the SCR quality criterion, which entails contractors to be able to validate on the day of the review, a total increase in access to SCR from period one to two. For the 28 April 2017 review point, period one is from Monday 27 June 2016 to Sunday 27th November 2016; and period two is from Monday 28 November 2016 to Sunday 30 April 2017. The calculator will show the number of times a pharmacy has viewed the SCR in period 1 and period 2. And will be updated every Thursday to show the latest figures. Officials in the European Union (EU) and the United States (US) have decided to start assessments of manufacturing sites for human medicines directed in their particular areas on both sides of the Atlantic. The contract will enable both the EU authorities and the FDA to make better use of their assessment funds to help them to concentrate on other parts of the world where active pharmaceutical ingredients (APIs) and medicines for the EU or US markets are manufactured. This will ensure that patients can rely on the quality, safety and efficacy of all medicines, no matter where they have been produced. Around 40% of finished medicines marketed in the EU come from overseas and 80% of the manufacturers of APIs for medicines available in the EU are located outside the Union. Each year, national proficient authorities from the EU and the US Food and Drug Administration (FDA) inspect many production sites of medicinal products in the EU, the US and elsewhere in the world, to certify that these sites operate in compliance with good manufacturing practice (GMP). Under the new agreement, EU and US regulators will rely on each other’s assessments in their own areas. In future, the need for an EU authority to inspect a site located in the US, or vice versa, will be partial to remarkable conditions. In the EU, inspections of manufacturing sites are carried out by national proficient authorities from EU Member States. The European Medicines Agency plays an important role in directing these activities in association with Member States. The contract is reinforced by strong evidence on both sides of the Atlantic that the EU and the US have comparable regulatory and procedural frameworks for inspections of manufacturers of human medicines. Teams from the European Commission, EU national competent authorities, EMA and the US FDA have been auditing and evaluating the respective managerial systems since May 2014, and have worked closely together to reach this agreement. The agreement is an extension to the EU-US MRA which was signed in 1998 but is not yet executed. Many provisions of the agreement have already entered into force and others will enter into force on November 1, 2017. By that date, the EU will have completed its valuation of the FDA and the FDA is likely to have accomplished its valuation of at least eight EU Member States, and will be progressively prolonged to all Member States.